TD membership provides access to thousands of career-enhancing training and human performance resources (including free webcasts), many national and online opportunities to connect with colleagues, and a vast selection of discounted conferences, products and services for knowledge and professional development. You get informative e-newsletters, the monthly T&D magazine, the annual ATD State of the Industry Report, and access to ATD's searchable Online Library of over 20,000 business book summaries and full text articles from more than 3,000 periodicals and magazines. Click HERE to register for your Power Membership. How to Benefit Your Local Chapter! ATD and your Northeast Florida Chapter of ATD are separate entities. Membership in either does not automatically include membership in the other. Each offers valuable benefits that complement those of the other. Both organizations strongly recommend complete dual membership. 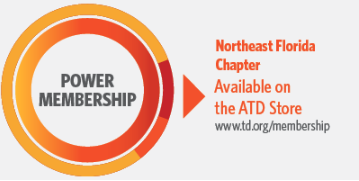 Whenever enrolling in or purchasing products from ATD, get the best price and support your local chapter by using our Chapter Code, CH9036. A small portion of the transaction is shared with your local chapter.